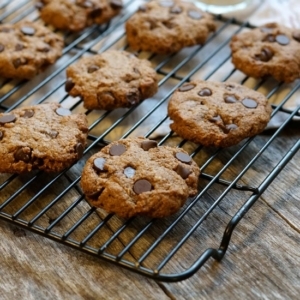 A vegan lactation cookie made with low-glycemic coconut sugar. In a large bowl combine the ground flax seeds with the water, and stir well to mix. Add in the coconut oil, coconut sugar, debittered brewer's yeast, vanilla, baking soda, and salt, and stir again until well combined. Gradually stir in the oat flour until a dough is formed, then fold in the 1/2 cup of oats and dark chocolate chips. Drop the dough by heaping tablespoons onto the lined baking sheet, then use your fingers to flatten the cookies. Bake at 350F for 10-12 minutes, until the cookies are lightly golden around the edges. I prefer mine baked for 10 minutes, so that they are crisp around the edges, but still nice and soft in the center, but they will firm up more the longer you bake them. Allow the cookies to cool on the baking sheet for 10 minutes, then transfer them to a wire rack to cool completely. *If you are gluten-intolerant be sure buy certified gluten-free oats. If you cannot find a brewer's yeast that is certified gluten-free, try using nutritional yeast instead, which is thought to have similar properties for milk production.